After my slightly miserable post recently I had a big old moan to Tom about things. I poured my heart out about everything; how I’m worried about discipline and feel like I need some guidance. How M’s sleep patterns are stressing me. How her dislike of being carried at the moment is upsetting me, as though it’s a personal affront. We talked for ages and I felt much better for it! I started to see the positive in parenting a toddler once more and made a decision to take a step back, de-stress and go with the flow a bit more. 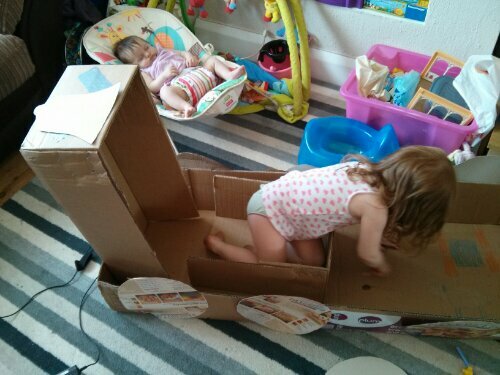 I remembered one wonderful day with M when it was too hot to go anywhere, and we stayed indoors and made a train out of cardboard boxes. 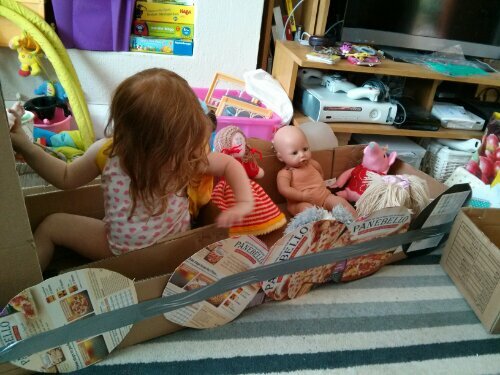 E spent ages sleeping in the bouncy chair which allowed me to really interact with M. We cut wheels out of pizza boxes and used duct tape to stick out all together. We made an engine and a carriage, a bell and seats. 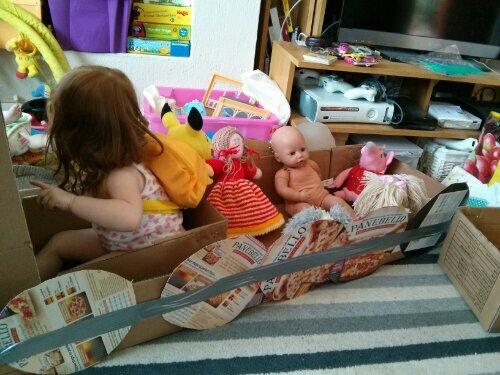 Dolls and toys were brought down to be passengers. The activity lasted all afternoon and M continued to play with her train for several days after too. It was one of those wonderful activities that just captured her imagination and she really got stuck into. In fact I was able to watch her and play about a bit on my phone because she was having so much fun she didn’t need 100% of my attention. (I still gave her 99% of it though…). Recently, M mentioned the train. I think she’d seen a big cardboard box and said something like “maybe we can make a train again?” in a hopeful voice. It’s clearly an important memory for her, something she loved doing and wants to do again.